The Gentleman Crafter: Graphic 45 -December Calendar Page- Done! Graphic 45 -December Calendar Page- Done! Please do me the honor of joining me over at Graphic 45's Blog for my last Graphic 45 reveal. 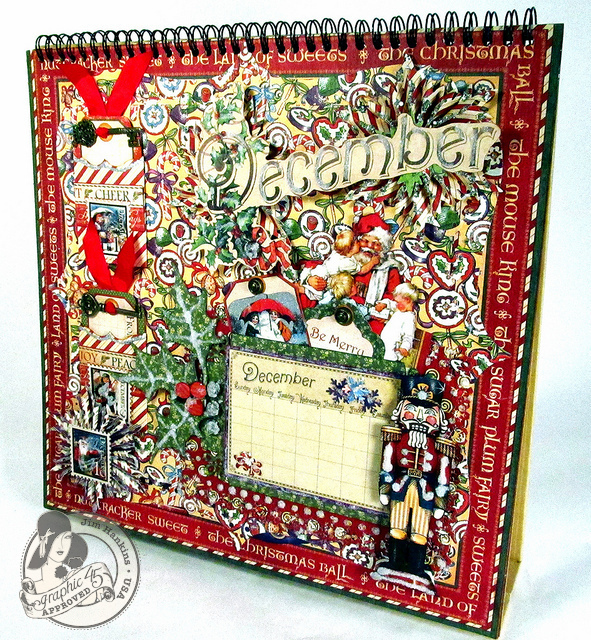 It's the December Calendar page and tutorial from Graphic 45's new Place In Time Collection. Each of the designers received a month and guess what...I got my favorite month...December Yahoooo!! LOL! This fun collection has a bunch of great cuttables, calendars and so much more. It was truly a delight to play with. Thanks G45 for this incredible collection! Thanks for coming by to visit! Jim, your heart and art are such a blessing to all of us. This page is so full of fun and memories I just can't quit smiling. Your tute is fantastic! We are on the same page! Ok, same calendar anyway. Saw this at Archivers last week and grabbed the 8 X 8 and am slowing working away on it! Did you see the neat calendar shadow box they made with it? I am furiously copying it for an Xmas gift! What a joyful page! Thank You so much for sharing. You rock my friend! It is a beautiful page!! I've enjoyed looking at it a good long while spying all the fun elements! beautiful last project for G45! Love it! Best wishes as you spread your wings! Love this page, so festive and cute! Love the tags on it, too. I sit amazed once again at your artistic ability and ponder if my artistic ability went the way of the wind! wonderful! I am not surprised by your page... you are just an inspiration! I am sure Graphic 45 is gonna miss ya! Awesome page Jim, glad you were able to participate... you'll be missed around G45 ... BUT I KNOW where to find you ... LOL !! gorgeous calendar page. amazing. thanks as always for sharing. I love this! I thought I did not want this paper collection but after seeing this calendar page it is now a must have. You are such an inspiration in all of your work. I sure will miss your G45 creations but I can not wait to see what is next from you Jim! Uncorked Christmas Tree- and A Wonderful Video!